By way of the Route 60 Sentinel I found a link the the new City of Enid Master Trails Project. Here you can find pictures and updates. recreation, transportation, and economic pursuits. improve access to recreation resources and improve transportation efficiency. The part I like is the focus on transportation. The ability to quickly get around town without the dangers of traffic is a huge relief. I have been commuting to work and running errands by bike for years. I have become comfortable on the city streets. And even though these trails are not officially opened, I have noticed the pleasure of a car free environment while using them. What can we expect next? Once they complete the Railroad Pass Trail (Wheatridge to Parkway), they will start on the Channel Freeway Trail (Cheastnut to Meadowlake Park). And step three will be the Quail’s Quad Trail. Quail’s Quad Trail is a proposed trail in west Enid that begins at Chestnut Ave. and moves north along the drainage channel to Bunker Hill St. then east to Oakwood Road. Two additional segments branch off the trail connecting additional housing additions. Destinations served include numerous neighborhoods such as, Quail’s Creek Subdivision, Oakcrest addition, and Oakwood Estates as well as Glenwood Elementary School. I hope you are enjoying the new trail system as much as we are. The Trail System is slowly coming along. Not fast enough for my liking but the building crew has been working on it steadily. Still under current construction is the continuation of the existing Railroad Pass Trail. The old city trail was well used but the surface has not aged well. Grass has grown over the edges of the asphalt and significantly narrowed it. When first constructed, it could handle a bicycle going each way. Now the area is barely a lane and a half wide. This old portion spans about a mile from Parkway east to South Washington. The new construction is very nice. The paving is concrete; ten feet wide and smooth. As I type, there is a continous stretch from Oakwood to Cleveland. This includes a railroad crossing. Also from Parkway to Cleveland, the trail is spotty and still in need of completion. In the past I have ridden this section when it was dirt and it was fun. But now, it’s even better; fast, smooth, and car-free. You feel like you can travel without any effort and speed. While it was a great workout previously, it now is a serious way to get to where you need to go. But the best treatment so far is the new bridge near Hayes School. It spans the troublesome drainage channel. There is a pedestrian only bridge just south that was used by people going to Hayes. And I hope it remains. But this new one may replace it. 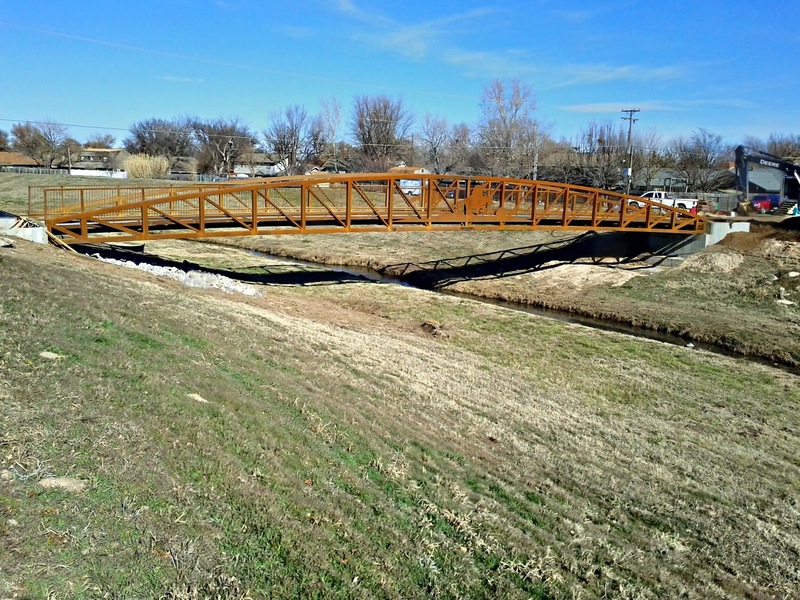 All and all, the Trail System will be a welcome addition to Enid. My hope is they will quickly turn to a North/South route next. It is greatly needed. As I said before, North Cleveland is a dangerous road. And South Cleveland is safest route to Vance Air Force Base. Connecting the base with the north will be huge. It’s been forever but I finally got to build a Windows Media Center DVR box. Back in February, I got my HDHomerun connected to an antenna and used a home baked script to view live television over my network using either VLC or mplayer. I even set up some cron jobs on my home server to ‘record’ some shows like a dvr. It worked, but not really well. Modern DVRs have guides and software that help you not miss future episodes and help you not record garbage when the program you wanted isn’t on. So I was frequently checking the listings on line to make sure I didn’t miss anything. What a hassle. Then I got my hands on an old HP laptop that sports a HDMI output and is running Windows 7. After a fresh install of the OS, I put it on my network and started up Windows Media Center (WMC). Set up Live TV to use my HDHomerun and waited for the guide to slowly download. I can’t stress it enough. Having a guide, an accurate and current guide is the only way to go. Now, I see in the WMC menus, that I can attach my home server’s share and then stream Photos, Music, and Movies. It works ok. I did have to install extra codecs to allow the stock media player to decode all the various files I have. While reading on line how to amp up WMC, I found that you could add plug-ins for Hulu Desktop and Boxee. Hulu Desktop is great to have. I do not have a Hulu Plus account, but it’s still fine all the same. I installed Boxee and with it’s great interface, codec support and imdb.com information, I don’t have to hunt for .nfo files and cover art any more. It’s so good that I removed the Movies Library from WMC. Boxee is my preferred interface for enjoying my movies, music and photos. It has all the streaming apps I need. It’s only draw back would be it’s Netflix app. It frequently doesn’t completely load correctly. I have found that the Netflix interface in WMC is far better. I am very happy with my current DVR/Media Streamer setup. I am considering removing the WDTV Live that I love from my home theater configuration. It just doesn’t get used. I have Live and Recorded TV, Netflix, and Hulu. I can stream all my media files from my server with out any extra work. And with the a browser handy, I even have flash. espn3.com and other sites like it are now available. So with all of this great content, I have dumped using Cable TV. My family still has it, but in our main viewing area, there is no cable content. I haven’t missed a bit of it. We had family and friends gathered to celebrate Enid High School Graduation. It was a whirl wind weekend. It all came to a point with commencement on Friday night. Here is a highlight video; approximately 5 1/2 minutes long. It starts with the Marli and Madison‘s valedictorian speech, then receiving their diplomas and finally the cap toss. My apologies for the shaky video. Unfortunately I left the tripod at home. We could not be prouder. Marli and Madison have worked for quite a long time to get this very point. I have heard them say that couldn’t wait until high school was finally done! This 4 1/2 minute video is just the highlights. This is an update to my previous post about Enid updating it’s city trail system. On Tuesday, April 19, the City unanimously approved the funding for Phase I & II. Phase I is to continue west from Parkway Street to Oakwood Street with a spur going south to Hays Elementary School. Phase II will extend Phase I from Oakwood Street to Garland and continue the southern spur past Hays Elementary to Rupe Avenue. Some bonus construction will be added. A trail head restroom and parking lot on Cleveland Street will be built where the Rail Road Pass Trail will intersect. I attended the City Council meeting to get more details of cost and construction but mostly to see which members were for and which were against. The City’s initial cost estimate for Phase I only was $1.5 million. And to include Phase II they were projecting over $2 million. The City wants to complete Phase I and II at the same time. But, alas, the Oklahoma DOT wants them done separately. Still the City found a way to fund Phase I and II with some added trail features for around $1.7 million. One of the savings, $30,000, was choosing concrete over asphalt for the trail surface. Contracts where awarded and debt was paid for engineering services . Construction should start in less than 60 days. Commissioner Don Rose, member of the city park board, seems to be the ‘Commissioner in Charge’ for this project. But there was no real opposition to this trail system. This has been in the works and on everyone’s to-do list for a very long time. The discussion was really uneventful; no fireworks at all. For more information, search the local newspaper, Enid News and Eagle.